Hello and welcome to Cork Institute of Technology. Chaplaincy understands how difficult it can be transitioning from secondary school to college, and we are here to care for and support you on this journey through CIT. Provide an empathic service to each other and to the wider community. The College Chapel (Room D155) is open all day. Mass is celebrated here Monday, Tuesday and Thursday mornings at 8.40 am during the academic year. The College Chapel also provides a place of reflection or place for you to unwind. Opens each morning at 8.30am. Here you will meet one of the Chaplaincy Student Support Team who will respond to whatever needs/questions you might have. Whatever the query none is too small, so approach us and see how we can help you while here at CIT. 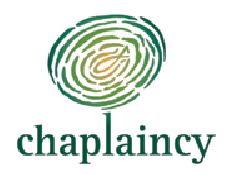 Your free weekly guide to what’s happening on campus 'This is a Chaplaincy' Publication. Available each Monday morning at the Chaplaincy ‘Info Desk’. Check it out for what is going on in: Sport /Societies/Students' Union/Chaplaincy/Info on CareersCompetitions and much more. Have a look at our Logo – what do you see? The core image of our logo is a fingerprint image, which represents each individual student, their unique traits as people and their problems. The fingerprint is constructed using independent lines, which collectively make up the fingerprint. These are the departments, organisations and groups that together form the community, which directly and indirectly influence and change individual students. While the centre of the fingerprint is a fish, which was the initial symbol of Christianity. Notice how the motif is linked to the text through the letter ‘l’. The way in which the letter ‘l’ extends to meet the fingerprint, creates a new image – a tree-representing nurture and growth. These 3 symbols illustrate the multifaceted tasks of the Chaplaincy Team on a daily basis..
We look forward to meeting all of you then throughout the year. We also want to wish you the very best during your time here at CIT.